There really hasn’t been a lot new going on at the Ye Olde Serial Distractions Basket Repair/Mule Shoe Detailing/Rum Quality Control Station™ of late. I have two stories on the “Hope and Rejection Tour”; one is being re-edited before being sent out again and the other is in a bit of a limbo with a publisher. I’m hoping to hear back on it soon. I also have a story that I submitted for an anthology that I’ve received no feedback on as of yet. The editor has indicated that they are still going through their submissions. Other than that, I’ve been in a bit of a holding pattern. I’ve done a bit of research for NaNoWriMo, coming up in just a few short weeks. I’m going to take some ideas I used in a failed short story and expand them. We’ll see how it goes. Anywho, I’m a alive if a bit slug-like. 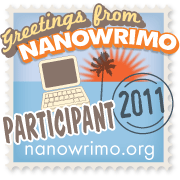 This entry was posted in Ramblings and tagged nanowrimo, publishing, short stories, writing. Bookmark the permalink.